Valentines Day is closing in and I wanted to share what the kids made for their classmates this year for Valentines. I am a pretty firm believer in giving non-cany valentines, considering the kiddos get plenty of other sweets between Christmas and this time of the year! Here is a really fun valentine that my son made from start to finish for his friends that is a colorful way to give a surprise without the added sugar. 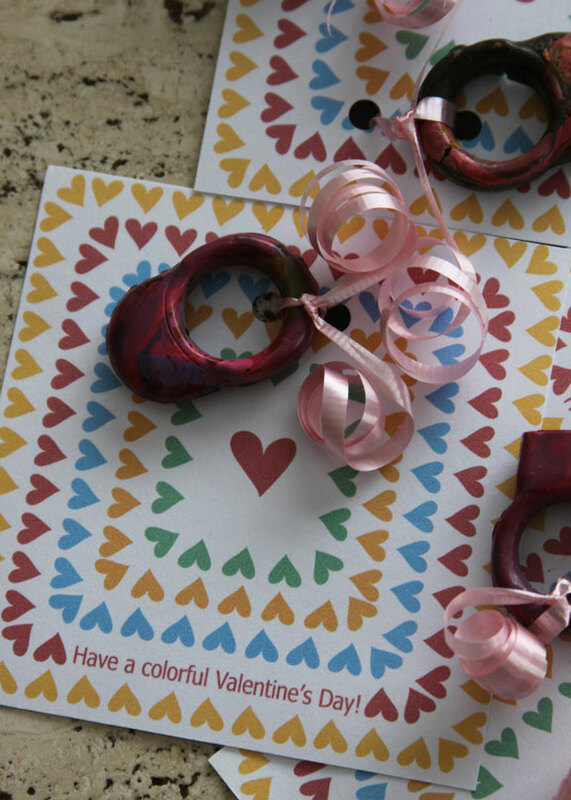 Homemade crayon rings with swirly colors and a message for friends to have a colorful Valentines day is the perfect sweet, but not TOO sweet gift! This year my 6 year old was the lucky recipient of one of those really cool Crayon creators. You know,the little machines that allow you to melt down your broken crayons, and remake them into cool shapes and swirly colors. SO fun for my little guy, and the perfect Valentines day solution for many reasons. 1. My son is a habitual crayon breaker for no apparent reason at all. Why not use the plethora of broken crayons to re-make new ones? 2. 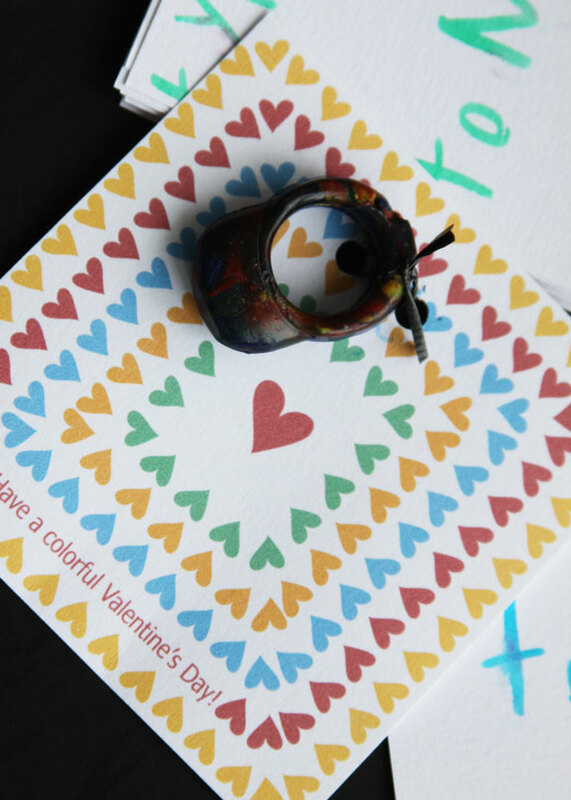 Making 20 some crayon rings was the PERFECT activity for a cold snow day home from school! 4. They were super inexpensive to create because we had everything we needed on hand to create them. 5. 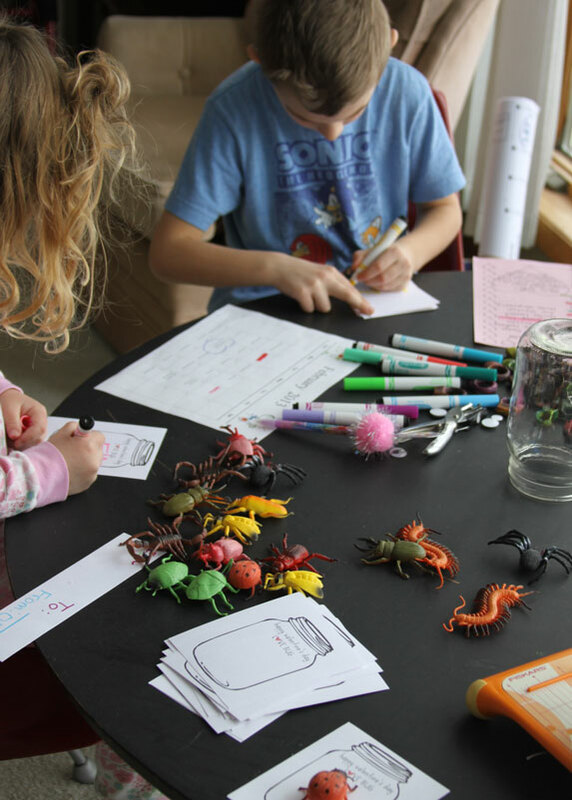 He was excited to give these non-candy valentines and I was happy to help him make them (quality time together on a cold snowy day is a bonus). 6. They are adorable, easy, fun, and done! 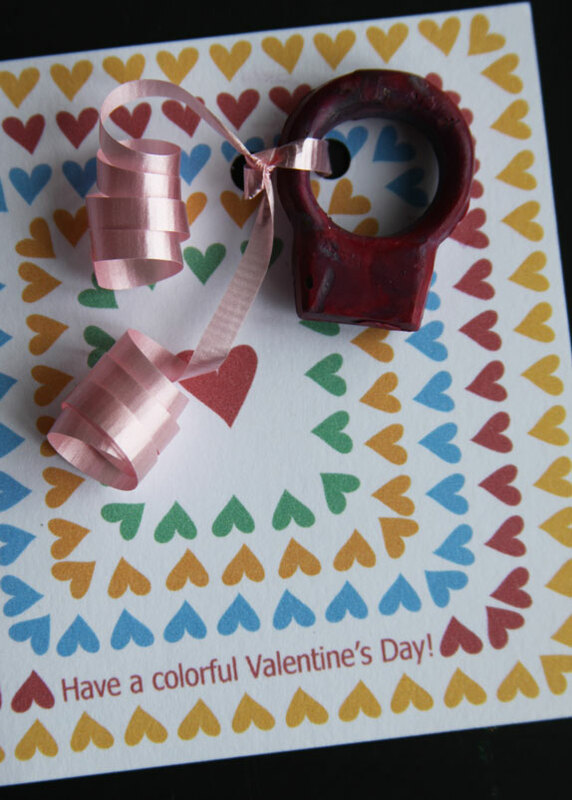 Time was limited for us so after all of the rings were made I pulled up this cute printable online to print and attach the crayon rings to. I printed them out and my son got right to work cutting them out, writing his message on the back, and punching holes for the ribbon. I helped him thread the ribbon, tie on the rings, and curl the ends. They turned out pretty fun, and I sure hope his friends get a kick out of the cool, colorful rings! Just right for a class full of first graders! 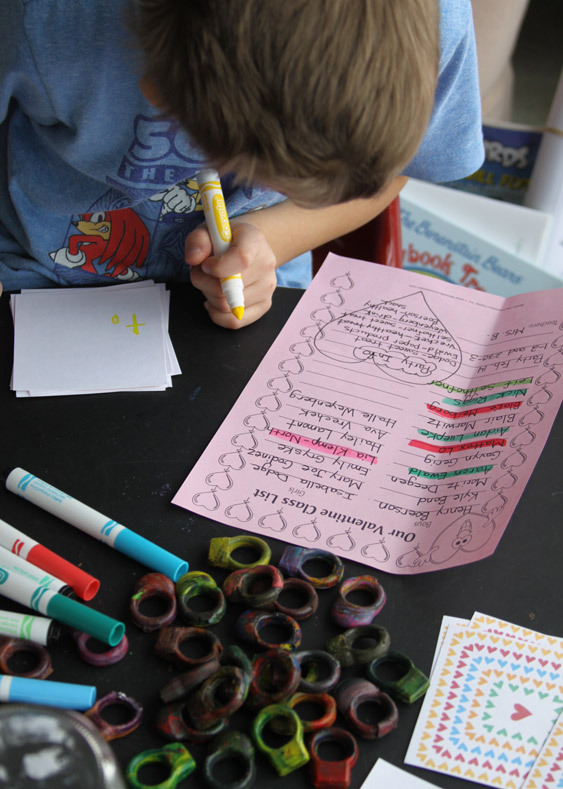 Find the very cool free printable “Have A Colorful Valentines Day” here from The Long Thread. 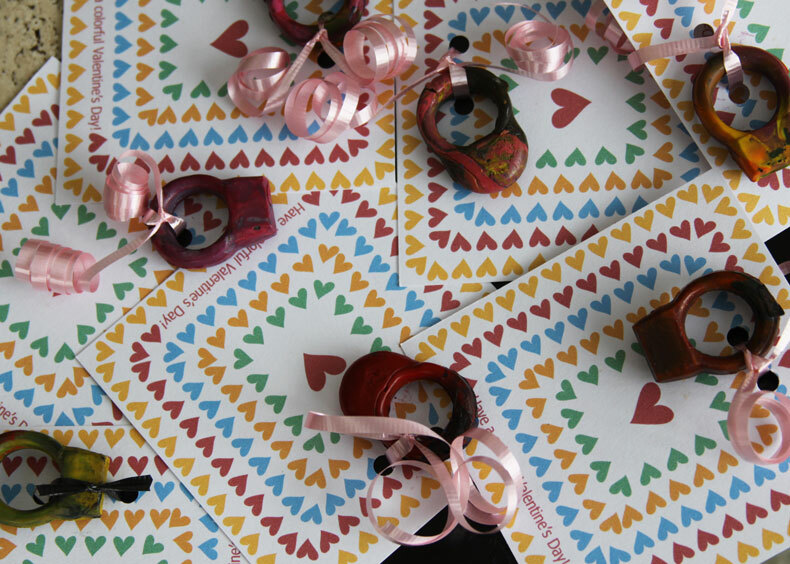 Check out last years similar non-candy valentines here! Including “Have A Ball”, You Color My World”, “I’m Crazy For You”, and more.